Paddy Power has continued its campaign of mockery against Russian athletes competing in the 2016 Olympic Games, this time offering money back if a Russian beats a British or Irish competitor. The campaign targets anyone betting on a British or Irish win, but "worried" by "Russian dopes" swooping in to take gold. This refers to the International Olympic Committee's decision to allow some Russian athletes to take part in the competition, despite evidence of state-sponsored doping. Rather than a blanket ban, the IOC is allowing individual sports' governing bodies to determine whether athletes are clean. The scandal has overshadowed the build-up to the games, which launch on 5 August. 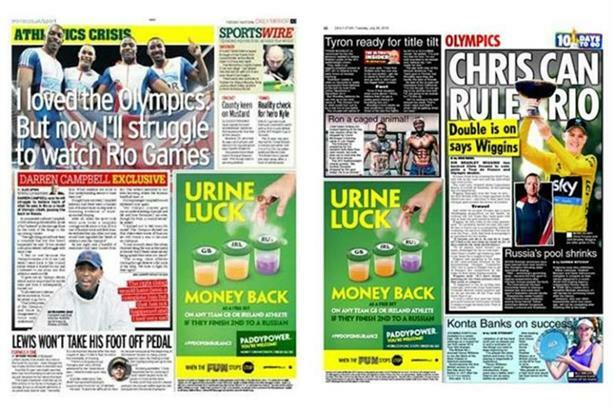 Paddy Power has taken out print ads for this morning's (26 July) Daily Star, Daily Mirror, Irish Daily Star and Irish Daily Sun, which read: "Urine luck. Money back as a free bet if a Team GB or Ireland athlete finishes second to a Russian." Ken Robertson, advertising director at Paddy Power Betfair, said: "When we heard about the IOC’s decision we were Russian around to see how we could help our punters, and money back as a free bet if a Team GB or Ireland athlete finishes second to a Russian seemed like a dope idea. "We’re very happy with the ad, and if anything it’s our creative team that have been taking performance-enhancing substances."